Alternate Titles: “The May Irwin Kiss,” “The John C. Rice – May Irwin Kiss,” “The Rice – Irwin Kiss,” “The Widow Jones. This is a medium close-up of two people, a man and a woman, kissing. 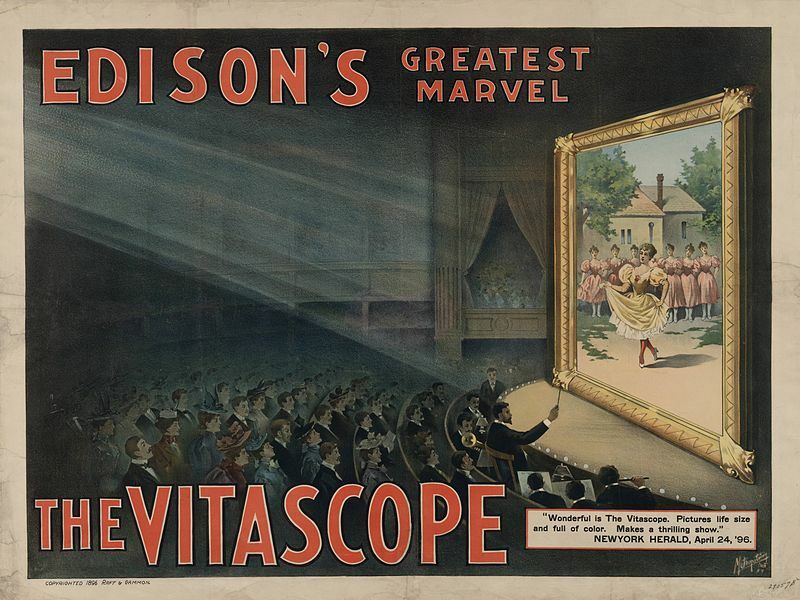 It was one of the first movies shot for the Edison Vitascope projection system, and was released with much ballyhoo. It should be noted that the Vitascope, while it was an important development in motion picture history, was not entirely successful. It apparently ran somewhat jerkily and unreliably, and required a great deal of electrical energy to run (there are reports of rather dangerous arrangements in which it was hooked up to streetcar tracks to siphon power). At the same time, the Lumiere Brothers’ Cinematograph and the new Mutoscope company’s device were in competition, apparently with rather more success, bringing in a profit for distributors, which the Vitascope mostly failed to do. But, back to “The Kiss.” John C. Rice and May Irwin were the stars of the theatrical hit “The Widow Jones,” which reaches a climax in Act I when the shy male lead kisses the widow. The Edison company brought these two stars to the Black Maria to film the famous scene. In fact, the kiss itself only lasts a few seconds, most of the film has the two of them speaking lines of (unheard) dialogue to one another with their faces pressed intimately together. Only at the end does Rice back off and straighten his mustache, taking her head in his hands and finally moving in for the kiss. It is noteworthy that, while Rice is middling-attractive, Irwin does not seem to be a “beauty” by contemporary standards or modern. The point, I think, is that passion is for anyone, not reserved to only the young or to those who meet certain subjective standards of beauty. There seem to be conflicting reports as to media reaction to this movie. Wikipedia, citing a source I’m not familiar with, claims that it was seen as “disgusting” and resulted in calls for censorship. However, Charles Musser, in “The Invention of the Movies,” claims that the result was to make John C. Rice into a “kissing star,” able to tour the coast giving men tips on how to kiss effectively. When Irwin tried to take “The Widow Jones” on the road with another male star, audiences wouldn’t have it, insisting she get back together with Rice, the best kisser in town. Either way, this movie seems to have been a big hit for the Edison studios, even if the machine it was produced for never took off.